Sunday means another blog without a NaBloPoMo prompt. 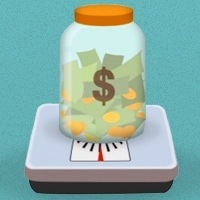 But that’s ok, I’ve just weighed out of Round 2 in the DietBet I’m in, so you can hear my tale of woe instead. First, incase you’ve never heard of DietBet before, it calls itself “social weight loss” and says that really there’s no real gambling as you’re in control of what you eat / how you work out, so it’s down to you if you win or loose. Normally you sign up to loose 4%!of your body weight in 28 days, it’s photo verification & there’s a secret pass code each time too. I’ve done a few DietBet4, as they’re now called, and had variable success, and 2 months ago I was invited to join the beta for a 6 month long DietBet, called DietBet10. I’ve got 6 months to loose 10% of my body weight, and half the monthly bet is saved for the final month, so there’s a massive incentive to stay through to the end. I was a winner in the 1st round, but this month I’ve just weighed out with a weight that was almost the initial weight. I started the game with. I blame Halloween. Oh ok, I blame myself for eating poorly over the past week, and being foolish enough to have too many sweets around for Trick or Treat, and then, when it rained and no kids came to the door, eating most of them myself. I’m not certain what will happen now I’m off the track, as this month I’ll have to loose more weight than expected to get back on track to have lost 10% by March 2014. Any other NaBloPoMoers done / doing a DietBet, or something similar? 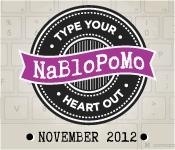 ← #NaBloPoMo Back to the Prompts!